You, right now have within you genius-level musical ideas, understandings, and abilities. You might find this hard to believe. The reason it’s so hard to believe is this: Right now the majority of these ideas, understandings, and abilities are just outside of your reach. Have you ever had the hunch that you have tremendous potential within you, but you can’t seem to tap into it? Well, there’s a reason you’ve experienced this feeling. And that reason is because it’s true. You DO have earth shattering song writing potential within you. And even better… there are methods you can use to “draw this potential” out for you and the world to hear. The next few hundred words may be the most important you ever read. This is because I’m about to tell you about a method that is proven beyond doubt to reach inside people and pull out the most amazing, genius-level abilities. The advances that people have made in their songwriting using this method are nothing short of astonishing. In fact, this method has produced more genius level musicians and artists than any other. What is this miracle method? Well, it’s called Socratic Method. You may have heard of the world renowned genius Socrates. Well it was this man who popularized this form of accelerated development. He didn’t actually invent it, but it was his contribution to the method that earned the name “Socratic Method”. Before telling you more about how this method works, let me give you an idea of it’s power. This amazing method of accelerated development first began being utilized in late classical Greece, where it began literally drawing out genius in just about everyone it touched. And this was no fluke. The method was unleashed at full strength again in Renaissance Europe (population in the hundreds of thousands), and once again the number of geniuses produced was staggering. Just like the earlier example, the rate of world class geniuses using Socratic Method makes today’s teaching methods look dismal. To give you an approximate number, Socratic Method produces geniusesat a rate of 10 million times that of today’s teaching methods. This brings up an obvious question. Why in blazers wouldn’t we continue to develop using this powerful ancient method in today’s teaching? Well, as it happens it’s a numbers game. The use of Socratic Method relies on each teacher focusing only on 1 to 2 students at a time. So when classes began to exceed the 20-30 mark it became almost impossible to maintain this way of teaching. You Might Be Wondering What On Earth This Has To Do With Songwriting? I hate to say it, but I’ve got bad news. This completely inefficient method of teaching that is in use today in schools and universities, has carried over into music development methods. Pretty much 99% of the music tuition, composing information and songwriting instruction out there follow this ineffective, modern way of teaching. And it’s DESTROYING your potential as a songwriter, and BLOCKING all the wonderful natural ability that you have. A very important concept that comes from Socratic Method is the idea that genius is already within you. But to get to it you need to “dig past” the shallow “short cuts” and “stock responses” that we usually rely on… which leads you to discover your much richer, deeper creative resources. Do you ever sit on your instrument and end up playing the same boring stuff? Or do you write lyrics and repeat yourself, saying the same thing in a slightly different way? This is a poison habit that the ineffective modern way of learning music ingrains into you. On the flip side, using Socratic Method to write music and lyrics will lead you into the most breathtaking musical territory, over and over again. Each time you sit down to write music or lyrics you will once again be blown away at the depth of your creative ingenuity. The exciting thing is: it’s very possible to “snap out” of the old way of thinking, and adopt the powerful Socratic Method to write music. And when you do, you will actually experience what it’s like to have genius-level ideas, understandings and abilities. I’ve published a course that’s designed to show you exactly how to do this. 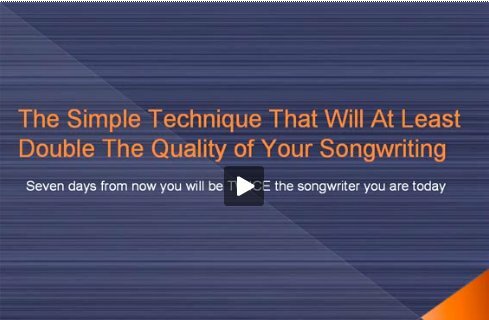 This course teaches you everything you need to know about how to write music in this new, amazingly effective way… as well as gives you techniques and exercises to allow you to experience the results for yourself. Hundreds of musicians have gone through this course, and not a day passes where I don’t get a email or letter detailing the precise moment when everything clicked for them, and they finally tapped into their full potential as a musical artist.